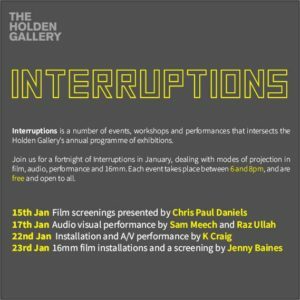 Interruptions is a number of events, workshops and performances that intersects the Holden Gallery’s annual programme of exhibitions. Its short-term format enables different methods of working, allowing invited artists to experiment in the large scale gallery space, and encourages collaborative practice across disciplines in a series of one-off events. The first group of Interruptions take place in January, and focuses around different modes of practice that deal in projection. Each event takes place between 6 and 8pm, and are free and open to all. Artists: Amelia Crouch, Oliver Czarnetta, Sam Ekwurtzel, Daniel Faust, Benjamin Hirte, Paloma Munoz & Waler Martin, Rohwajeong, Giles Round, Vanessa Safavi, Aki Sasamoto. 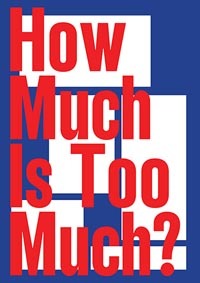 Curated by students of the School for Curatorial Studies, Venice. Tickets are free to Second Home members or £3 for non-members. (Tickets here). Hear artist Amelia Crouch share and discuss extracts of her recent work Spectral Evidence (2016). 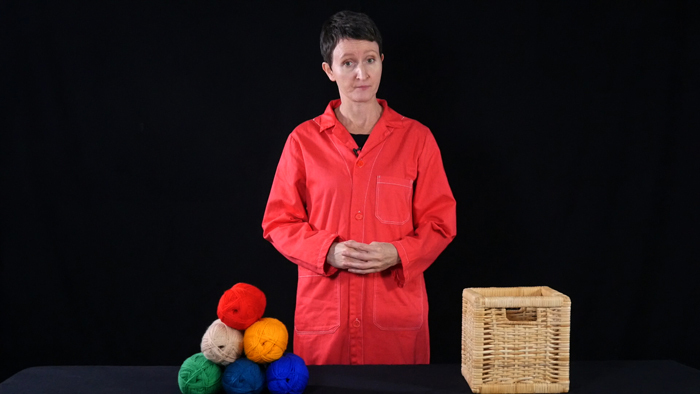 This moving image artwork, exploring colour perception and colour language, combines research into the evolution of the eye, the physics of light, linguistics and semiotics. The piece was produced for The Scientific Method – a group exhibition of moving image works that adopt scientific, quasi-scientific or pedagogical formats in order to consider the human search for systemic, graspable or quantifiable meaning in an uncertain world. Crouch co-curated the exhibition at The Tetley, Leeds, in 2016-17 and will talk both about Spectral Evidence and how it fits into her wider artistic research and interests. 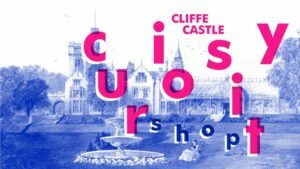 Artists Amelia Crouch, Luke Drozd and Katch Skinner create works responding to Cliffe Castle Museum. A screening of new works by the Film Material collective based at Rogue and emerging and established artists from across the UK. Featuring work by Jenny Holt, Chris Paul Daniels & Sam Meech, Kevin Craig, Tariq Emam, Maya Sherpa, Amelia Crouch, R L Wilson, MMU Graphics students and the Unravel Project. Join artists Chris Paul Daniels, Ope Lori and Amelia Crouch for an event aimed at early-career artists working with (or seeking to work with) moving image. Chis, Ope and Amelia will share extracts of their recent projects and discuss the trials and tribulations working with moving image, with an emphasis on the logistics of getting projects made. Topics will include: working with commissioners, seeking funding, site-responsive practice, technicalities of production and post-production, directing performers and finding exhibition opportunities. Artist presentations and discussion (2-3.30pm) are open to all. Additionally up to 12 attendees will have the opportunity for a 20 minute 1 to 1 session with one of the artists. These sessions are via application and will be led by participants taking the form of – for example – a portfolio review, artwork crit., targeted advice or feedback on a particular project you are working on. To apply: Please apply via Cutratorspace by clicking here with a short statement (maximum 200 words) outlining why you want a 1 to 1 session and what you hope to get out of it. Please also indicate if you have a preference for seeing a particular artist. Image: A Tiger’s Skin by Chris Paul Daniels. How do we make sense of today’s information overload, from post-truth politics to mind-boggling quantum physics and neuroscience? The Scientific Method shows how artists have revealed the structures and systems of knowledge that we consume daily, subverting the accepted and confounding the expected. 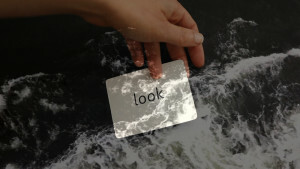 This exhibition brings together recent moving image works by artists Amelia Crouch, Patricia Esquivias, Sian Robinson Davies, Liz Magic Laser, Kate Liston and Yuri Pattison, alongside drawings by KP Brehmer and works by John Latham, Semiconductor and John Smith presented in association with LUX. Some artworks appropriate a faux-scientific rhetoric, others highlight the potentially unanswerable questions of contemporary science, or employ humour and irreverence to puncture conventional wisdom. Departing from the objective knowledge sought by the classical scientific method, these artists often foreground the bodily, the personal or anecdotal. For the next in its series of Launch Pad projects Castlefield Gallery is pleased to present the debut solo exhibition in a public gallery by Yorkshire-based artist Amelia Crouch. Selected from CG Associate members’ submissions by Adam Smythe, Curator at The Bluecoat (Liverpool) and Castlefield Gallery’s Programme Manager Matthew Pendergast. The exhibition will include new and recent works that playfully explore the semiotics of language with film, screen prints and text art. Launch screening 23 June, 7pm: The Albany Theatre, The Butts, Coventry, CV1 3BH. Exhibition 22 June – 7 July: City Arcadia Gallery, Coventry, CV1 3HW. I am pleased to be showing a new moving image work, commissioned by Coventry Artspace as part of the City Arcadia festival. Tomorrow Belongs to Nobody explores our relationship with Coventry’s post-World War II architecture. At the launch event I will give a short talk, my work will be screened and there will be a chance to watch the 1945 docu-drama ‘A City Reborn’, scripted by Dylan Thomas and directed by John Eldridge. Tomorrow Belongs to Nobody will also be screened on a loop at City Arcadia Gallery from 22 June-7 July. 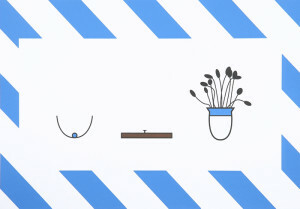 The screening is part of a whole range of activities taking place as part of the City Arcadia Festival, also featuring work by Lauren Heywood, Rob Hamp, Sadie Hennessy, Spencer Graham, Adam Steiner, Adrian Baynes, Julia O’Connell, Hayhoe & Haworth, Office for Art Design & Technology. Project commissioned by Coventry Artspace, funded by Arts Council England. Wednesday 1 June 2016, 6pm. 70 Oxford Street, Manchester, M1 5NH. As part of In Certain Place’s ‘Practising Place’ programme, I will be having a public conversation with literary geographer Dr. David Cooper. The event, which will take place at Number 70 in Manchester, will examine the role of language within experiences of place. Referencing locations such as the Lake District and the West Yorkshire estate of Whitley Beaumont, Cooper and Crouch will discuss how forms of language are used to govern, frame and re-inscribe particular places. 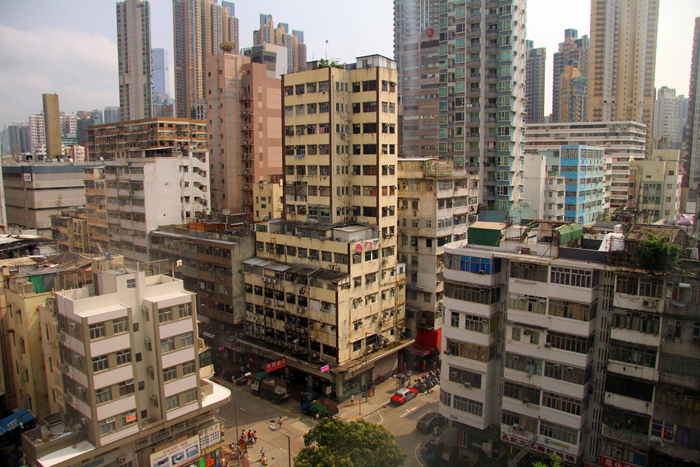 Drawing on their individual research, the speakers will also consider how place writing and visual art can expose the inherent tensions and hidden voices of landscapes, by attending to the intertextuality of place.